Pass Labs announced two new integrated stereo amplifiers at last week's CES: the 60-watt INT-60 and 250-watt INT-250. Both models feature four line-level inputs, a line-level output, and two pairs of Furutech speaker binding posts. Pricing and availability have not yet been announced. 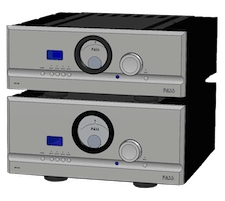 Pass Laboratories, Inc. introduced two integrated amplifiers, the INT-60 and INT-250, at the Consumer Electronics Show 2015. Both are stunning, flexible, and powerful new members of Pass Lab's family of music-first audiophile components. Pass redefined the way the audiophile industry perceived integrated amplifiers five years ago when it introduced their first-ever line of integrated amplifiers, which, among other advances, reduced the amount of gain stages normally associated with integrated amps from 6-9 to a streamlined two. The amps' unique topology proved to be the cleanest, most direct signal path possible, and the approach provided superlative audiophile performance in otherwise modest packages. Now, Pass is improving upon those pioneering integrated amps with new iterations that are both models of electronic elegance. Based on Pass Labs' lauded INT-30A, the 60-watt INT-60 Integrated Amplifier provides wattage with all the finesse and delicacy surpassing its predecessor, and works best with speakers of 87dB efficiency or greater. The INT-60 builds upon the INT-30A's legendary "You are there" soundstage, offering spectacular realism, even with difficult speaker loads such as electrostatics or planars. The INT-60 features the same power supply and output stages, along with the iconic glowing meter, as found on Pass Labs' Point 8 amplifiers. The new model features Direct Access buttons for the four inputs on the faceplate, a digital level display, plus a Volume Control knob and Mute button. On the back are four line-level inputs, a line-level output, and two pairs of Furutech speaker binding posts. The new INT-250 ups the wattage from the INT-150's 150 watts to 250 watts per channel. The INT-250 is optimized for greater versatility with speaker loads of 86dB efficiency or less. Like the INT-60, the INT-250 features the same power supply and output stages, along with the iconic glowing meter as found on Pass Labs' Point 8 amplifiers. It too features four line-level inputs, a line-level output, and two pairs of Furutech speaker binding posts. As with the INT-60, there are Direct Access buttons for the four inputs on the faceplate and a digital level display, in addition to a Volume Control knob and a Mute button. Both the INT-60 and the INT-250 are ideal for reference systems or secondary, superior audiophile systems, and were optimized by Pass Labs' unusually rigorous listening processes using six different sound systems to deliver exceptional musical experiences. • Pass Labs XA60.8 Mono-black Amlipifer Reviewed at HomeTheaterReview.com. • Pass Labs Introduces Two-Chassis, Dual-Mono Xs Preamplifier at HomeTheaterReview.com.